The latest version – shown off at the South Korean Electronics Show last week – sees the clamshell form factor replaced by a more traditional tablet shape, offering 4GB or 8GB of Flash memory, with Mini SD card expandability. When it comes to functionality, tech lovers shouldn’t be found wanting, with the W10 offering a FM radio, internet radio receiver, e-book reader, VoIP phone and – unusually – pseudo GPS navigation capabilities. This uses the built in Wi-Fi to provide a GPS-esque mapping tool that claims to display nearby points of interest based on where it thinks your hotspot is. We’re not entirely sure how it works, so we’ll have to wait on more specs from the iRiver boffins. 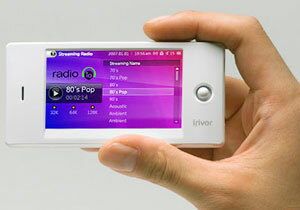 The media player sports an impressively high resolution class for such a little fella (3″ screen offering 480 x 272)and plays back H.264 and WMV video. 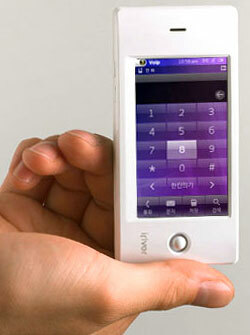 To make VoIP calling easier, the touchscreen display flips into a numeric keypad to dial phone numbers. There’s been no news from the South Korean company about release dates or pricing, although we wouldn’t be surprised if it’s turned into a laptop by the time we’d finished typing this. Or something even closer to the iPhone.